We offer a wide range of revolutionary systems for teeth straightening and closing gaps between teeth. We utilises the latest in 3D computerised imagery to generate a series of clear, see-thru teeth aligners or "nearly clear braces". Braces improve your smile by gently pushing teeth into correct alignment. It is now a popular and effective treatment for adults. Tom Cruise has recently had an orthodontic appliance fitted. Teeth that are correctly aligned can resolve gum disease, headaches, facial and jaw pain. Your mouth will be healthier and teeth will be easier to clean. New Invisalign® Braces can give you the beautiful straight teeth you’ve always wanted. It works through a series of invisible, removable, and comfortable aligners that no one can tell you’re wearing. So you can smile more during treatment as well as after. Your Invisalign® treatment will consist of a series of aligners that you switch out about every two weeks. Each aligner is individually manufactured with exact calculations to gradually shift your teeth into place. And since your Invisalign® system is custom-made for your teeth and your teeth only, with a plan devised by you and your dentist or orthodontist, you know you’ll end up with a smile that truly fits. At the London Dental Studio Dr. Sherlock offers a highly personalised service. He offers a free consultation to all patients, in which they have the opportunity to explore, in a relaxed way, all the options for creating The Perfect Smile. With his wealth of experience in treating everything from the most simple cases to the most complex including craniofacial and facial deformity, he can help you find the treatment that is perfectly suited to your needs. Many of his patients have achieved the perfect smile in between 3 to 6 months. Patients with more complex problems can achieve the perfect smile in around 1 year. Lingual braces are placed behind your teeth (i.e on the tongue-side of the teeth) and are therefore completely invisible to other people. They are very well-tolerated by other people. Orthodontists need special training to be able to treat patients with lingual braces. Therefore, not every orthodontist provides them. Dr. Sherlock provides lingual braces for many of his orthodontic patients who want themselves and the orthodontist to be the only ones who know they are wearing braces. These photographs are examples of lingual braces which fit on the “inside” of the teeth and are not visible when talking or smiling, thus making the treatment go unnoticed to all but the patient and the orthodontist. One of the Lingual braces (fitted on the “inside” of the teeth) used by Dr. Sherlock is the In-Ovation® LMTM system. This system represents a breakthrough in cosmetic orthodontics for patients who are seeking fast, cosmetic correction of misalignments and yet who are not willing to wear braces that are visible. With the In-Ovation® LMTM system minor misalignments can be corrected to produce the perfect smile in just a few months. Tooth-coloured ceramic braces placed on the front of the teeth blend into the colour of the natural teeth and are far less visible than conventional metal braces. Everybody can be treated with ceramic braces and it is suitable for both adults and children. Some celebrities wearing orthodontic braces. Tom Cruise wearing conventional aesthetic braces with ceramic brackets. Gwen Stephani wearing traditional metal braces. Prince Harry wearing conventional aesthetic braces. Orthodontics is a specialist area of dentistry. It is concerned with the development of the teeth and jaws and the correction of problems that occur with the tooth and jaw positions. What is the specialist list in orthodontics? A specialist in Orthodontics has completed at least three years of postgraduate study in Orthodontics after graduating as a dentist and obtained further training from the Royal College of Surgeons. His or her name will appear on the Specialist list of the General Dental Council. What is a Consultant in Orthodontics? A consultant in orthodontics is a specialist in orthodontics who has completed at least an extra 2 to 3 years of orthodontic training, in addition to their speciality training. This additional training enables them to develop the skills needed to treat the most complex orthodontic problems as well as enhancing their understanding of the orthodontic treatment overall. As an orthodontic consultant Dr. Sherlock is amongst the most highly-trained dental specialists in the world. When can a child begin orthodontics? Occasionally early treatment may begin at around 7-8 years of age for problems involving the positions of the jaws. Ideally 9-10 a child should see an orthodontist around 9 to 10 years to check on the development of the permanent teeth and sometime at this time orthodontics is started. The most common time to start orthodontic treatment is around 11 to 14 years of age when most of the permanent teeth have come into the mouth. There is no age limit for orthodontics – it can be done at any time of life. You can never be too old to have treatment. If you have a complex problem Dr. Sherlock can work with your dentist and other dental specialists to achieve the perfect smile. Why do I need orthodontic treatment? As well as enabling you to have ‘The Perfect Smile’ Orthodontic treatment can also improve the function and health of your teeth and, in some cases, improve also the health of associated structures such as jaws and joints. This depends on the problem to be treated. It can vary from a few months to 2 years. Many of Dr. Sherlock’s simpler orthodontic cases can complete the treatment in between 3 to 9 months. Fixed braces attached to the teeth can be placed on the front or the backs of the teeth. They can be made of steel, ceramic (tooth coloured) and gold. Functional appliances used in children to correct positions of the jaws are made of acrylic. Can braces be totally invisible? Yes, braces placed on the backs of the teeth (i.e. 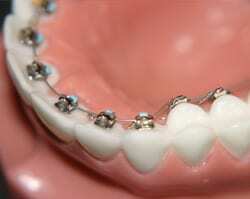 lingual braces) are totally invisible. Clear braces (aligners) are only slightly visible. A type of brace used in children and adolescents to correct positions of the jaws while the child is growing. 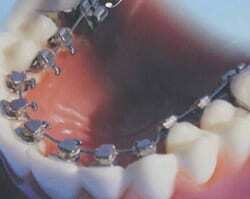 Braces are placed on the backs/ inner surface of the teeth and are therefore totally invisible. Treatment with clear plastic aligners instead of fixed braces. These ‘Invisalign’ braces are barely visible. Surgery on the jaws to correct the position of the jaws and improve the way in which the upper and lower teeth fit together. After braces are removed the teeth must be kept straight while the bone and gums adapt to the new tooth position. Retainers can be removable or fixed (i.e. stuck to the backs of the teeth).